Terme di Saturnia – hľadáte hotely v okolí? Set in its own spacious garden, and immersed in the Maremma countryside, Poggio Degli Olivi features a swimming pool, free private parking, and self-catering accommodation. Vidiecky dom Residence Bartolini sa nachádza iba 400 metrov od horúcich prameňov Terme di Saturnia a golfového klubu. Zdarma tu máte k dispozícii minigolfové ihrisko i požičovňu bicyklov. Featuring a private garden and a shared lounge, B&B 8380 is set in Saturnia, 300 metres from Terme di Saturnia and 800 metres from the Cascate del Mulino thermal waterfalls. Villa Clodia is set in the heart of the spa town of Saturnia, offering panoramic views across Valle delle Terme. It features a swimming pool, gym and free parking. Ubytovacie zariadenie La Casa Delle Cascate s vlastným stravovaním sa nachádza v meste Saturnia, vedľa prameňov Cascate del Mulino, a ponúka vlastnú záhradu a gril. Poggio Bertino is a comfortable family-run country hotel nestled between the mediaeval villages of Montemerano and Saturnia. 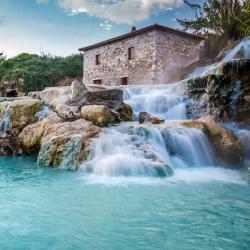 The establishment is only 2 km from the thermal resort of Saturnia itself. This small, charming hotel is located in the heart of the Tuscan Maremma, just 9 km from the thermal spas of Terme di Saturnia and the Saturnia Golf Club. What a wonderful place. Anglea and Enrico made us feel welcom from the moment we arrived. Featuring a garden and a restaurant, Mastro Titta Pizza Eat & Sleep is situated in Montemerano. Boasting luggage storage space, this property also provides guests with a terrace. Hotel Rossi is situated in the heart of Manciano, in the beautiful Maremma area of Tuscany. It offers stylish air-conditioned rooms with panoramic views of the Tyrrhenian Sea. Featuring a natural thermal swimming pool and a well-equipped wellness centre, Hotel Relais Valle Orientina offers a restaurant and is 3 km from Pitigliano. At the far side of the beautiful medieval hamlet of Sovana lies Sovana Hotel & Resort, a restored country house surrounded by Tuscan countryside, with its own wonderfully designed gardens. Set on a hill, Bagno Santo Hotel is a traditional Tuscan villa surrounded by a landscaped park featuring cypress and pine trees. Tento rezort sa nachádza 5 km od stredovekej dediny Saturnia a pýši sa 18-jamkovým golfovým ihriskom a elegantnými termálnymi kúpeľmi postavenými z travertínu, v ktorých nájdete rímske kúpele a... Beautiful facilities and really friendly staff. Set in a green valley in the Maremma area of Tuscany, Hotel Scilla is part of an ancient hamlet inside Sovana's historic centre. It features extensive gardens and a restaurant. This Tuscan villa, designed by Paolo Portoghesi, is immersed in the green landscape of the Tuscan hills and overlooks the Valley of Saturnia. It features a wellness centre and free Wi-Fi throughout.